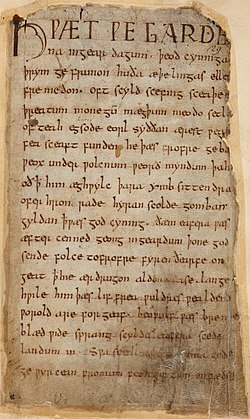 19th century studies proposed that Beowulf was translated from a lost original Scandinavian work, but this idea was quickly abandoned. But Scandinavian works have continued to be studied as a possible source. Proponents included Gregor Sarrazin writing in 1886 that an Old Norse original version of Beowulf must have existed, but that view was later debunked by Carl Wilhelm von Sydow (1914) who pointed out that Beowulf is fundamentally Christian and written at a time when any Norse tale would have most likely been pagan. However, Friedrich Panzer (1910) wrote a thesis in which both Beowulf and Grettis saga drew from a common folkloric source, and this encouraged even a detractor such W. W. Lawrence to reposition his view, and entertain the possibility that certain elements in the saga (such as the waterfall in place of the mere) retained an older form. The viability of this connection has enjoyed enduring support, and was characterized as one of the few Scandinavian analogues to receive a general consensus of potential connection by Theodore M. Andersson (1998). But that same year, Magnús Fjalldal published a volume challenging the perception that there is a close parallel, and that tangential similarities were being overemphasized as analogies. However, although this folkloristic approach was seen as a step in the right direction, "The Bear's Son" tale has later been regarded by many as not a close enough parallel to be a viable choice. Later, Peter Jørgensen, looking for a more concise frame of reference, coined a "two-troll tradition" that covers both Beowulf and Grettis saga: "a Norse 'ecotype' in which a hero enters a cave and kills two giants, usually of different sexes"; which has emerged as a more attractive folk tale parallel, according to a 1998 assessment by Andersson.